What’s better than picking up a happy dog from Camp? Picking up a clean and happy dog from Camp! Camp Bow Wow® is happy to provide nail trimming and bathing services that will leave your pup looking and smelling their best. Bathing them on your own is often time-consuming, exhausting, messy, and stressful for both you and your four-legged family member. Rather than trying to do the job yourself after a long, tiring day, why not let us take care of it during your dog’s stay? With dog grooming areas specially designed for your pup’s comfort, Camp Bow Wow can take this off your to-do list. By adding a bath to your pup’s stay, you can cuddle with a squeaky-clean pup when you get home. Contact us at (817) 735-9663 to learn more about our dog grooming services. 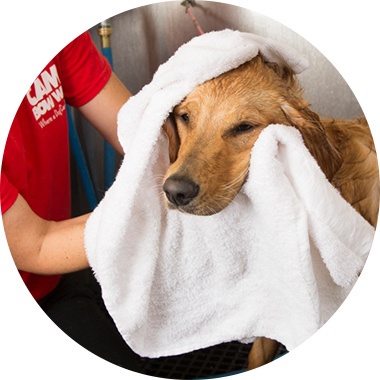 Bathing your dog is a hassle, so let us do the dirty work and you can pick up a clean dog after their stay! Ready to bring home a squeaky clean pup?